Despite it's name, the Australian Shepherd as we know it today was developed completely within the United States. In the late 1800's and early l900's the forerunners of today's "Aussies" came to the western and northwestern states as stock-dogs for the Basque shepherds that accompanied the vast numbers of sheep then being imported from Australia. These hard working, medium sized, "little blue dogs" impressed the American ranchers and farmers, who began using them as well. 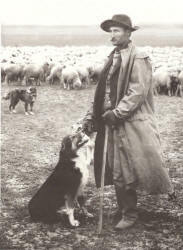 Breeding was done for working ability rather than appearance, and occasionally dogs of other herding breeds were bred into the lines. However, today's Aussie still resembles the dogs that came from Europe via Australia, and great numbers of Aussies are still working stock on ranches, particularly in the western states. Although blue merle is the most commonly seen color form of the Aussie, black, red, and red merle are also acceptable colors. All four colors may also have white and/or copper (tan) trim. Occasionally unacceptable colors such as sable are encountered, possibly retained in some lines as a recessive trait from the early days. Some Aussies are born with a natural bob-tail, others are born with a full-length tail which is traditionally docked within a few days of birth. The average size of adult Aussies is about 20-23 inches at the shoulder for males and about 18-21 inches for females. The coat is medium length and straight or wavy. Ears generally break slightly above the base and fold over forwards or to the side. The head has a distinctive "Aussie" structure, and the body is usually just slightly longer than the height of the dog, muscular and compact. Of course individual dogs may differ to some degree in any or all of these ideal characteristics. The Australian Shepherd Club of America (ASCA) was formed in 1957 to promote the breed, and several clubs kept breed registries. A unified standard was adopted in 1976, and the registries combined in 1980. (National Stock Dog Registry has a separate Australian Shepherd registry.) ASCA has promoted the breed with conformation, stock-dog (herding), and obedience programs. An excellent book about the breed is "All About Aussies" by Jeanne Joy Hartnagle (Alpine Books). Aussies excel not only at herding, but also Obedience, Dog Agility, and Fly-ball, not to mention Tracking, Pet Therapy, and other dog activities. Today there have never been so many opportunities for Aussies!